There is something to be said for the simplicity of a salad. There’s a lot more to be said for the sheer versatility of them! I mean, would you look at this? It’s a flavour explosion of epic proportions. Chili powder, oregano, garlic, shallots, onion, cumin, paprika, crushed red pepper flakes, bell peppers AND jalapenos? Come on! Typically when I start putting a salad together I really don’t know what the end result is going to be. I always have some idea of the direction I’m heading just not always sure how I’m going to get there. That’s what I love about cooking from the cuff, it’s always a little of this and usually a whole lot of that. This one started from one of those “On this day” reminders over on Facebook. It seems that this time of year was my favourite for travelling to Mexico so my newsfeed has been full of the requisite laying on the beach while staring out at the crashing surf with a fruity drink in hand pictures. But yet what I remember most is the food I ate while I was there. And, no matter which dish I remember the first thing that comes to mind is how fresh everything was. Because it was. I love Mexico. I wish The Donald would cut them some slack already. Sure, they’ve got their problems. What country doesn’t? Besides, no Mexico, no guacamole. That alone is reason enough to play nice. As usual, I had almost everything I needed for this fiesta on a plate. I did have to run to the store and grab some bell peppers but otherwise I managed to find everything I needed in my freezer, refrigerator or pantry. I realize some of you might find that hard to believe but I’m going to let you in on a little secret: if you keep your kitchen stocked with nutritious and delicious food it will be ridiculously easy to come up with a meal like this. Every day. Cross my heart. It also helps that there are a gazillion of us out here on the interwebs who have a penchant for sharing the food we love with anyone who’s interested so there is no shortage of ideas out there. I managed to pull this together in a matter of 30 minutes. I actually timed myself so I could tell you that. Also, because one day I think I will be on Chopped. Practice makes perfect. So, let out your inner chef du cuisine (that’s French for boss of the kitchen) and make this salad. Andale! Place chicken breasts in a baking pan. Coat evenly with olive oil and taco seasoning. Cover with aluminum foil and bake in oven at 400C for 25 – 30 minutes or until internal temperature reaches 180C. When ready, remove chicken from the oven, set on plate and let rest. Finely chop shallot. Place in bowl and cover with juice of 1 lime. Let stand for 10 minutes to “cook” the shallots. Do this now so it’s doing it’s thing while you chop and saute your vegetables. Cut peppers and onion into thin strips. Heat avocado oil in skillet. Add vegetables. Season with chili powder and juice from 1/2 a lime. Add salt to taste (a couple of pinches). Saute until soft to the bite (don’t overcook them until they are mushy). Remove from heat and set aside. Cut open both avocados and scoop flesh out of skin. Place in bowl and mash until smooth. Add shallot and lime mixture, chili powder, garlic powder and salt and stir to mix. Wash lettuce. Place 4 leaves on each plate. Slice chicken and add to salad. 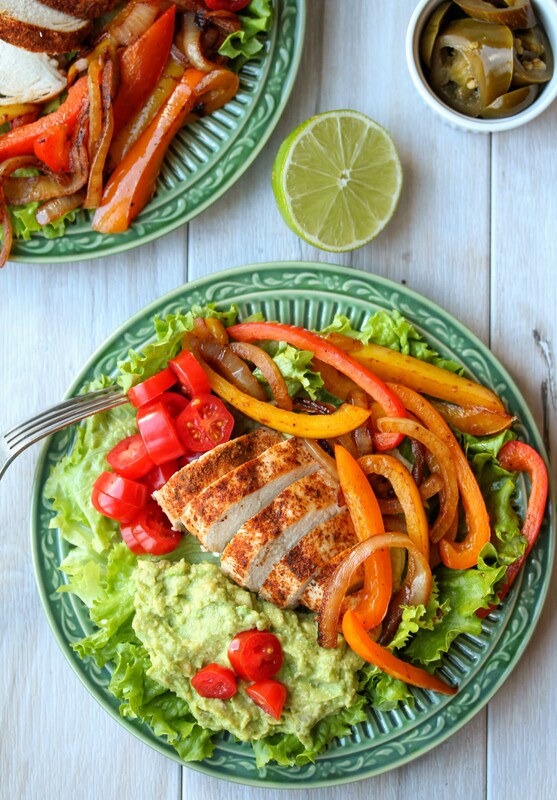 Add sauteed vegetables, sliced tomatoes and a large dollop of guacamole. Serve. Enjoy!